If you don’t already have at least one maxi dress in your wardrobe, what are you waiting for? The elongating dress of the season is a key piece for any petite – and don’t believe what you’ve heard, they do not have to swamp us, and in fact can be one of the most flattering styles you’ll own. From bright prints for the day time to the dressy numbers of night, there’s a maxi dress to suit every petite woman. Creating a block of solid colour or pattern head to toe, maxi dresses are slimming, add height and are bang on trend for the season. There’ll be no time spent worrying about matching separates with these must have items; with a great maxi, you’re outfit is ready in one. 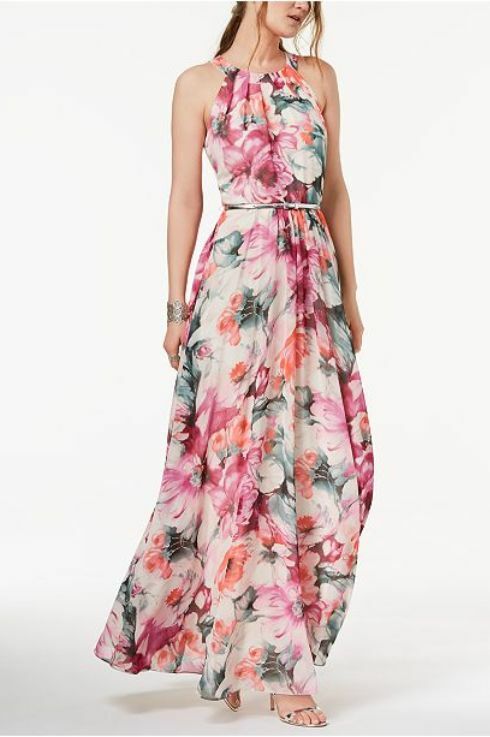 We adore the floral highlights of this stunning maxi. This dress would look perfect on either hourglass or pear figure, with the low v-neck being universally flattering, and the unique lace-up back a stand-out feature both body shapes will benefit from. It comes with a matching shawl to complete the look. This shimmery, gold number is the perfect piece of beautiful petite clothing we’ve been looking for. 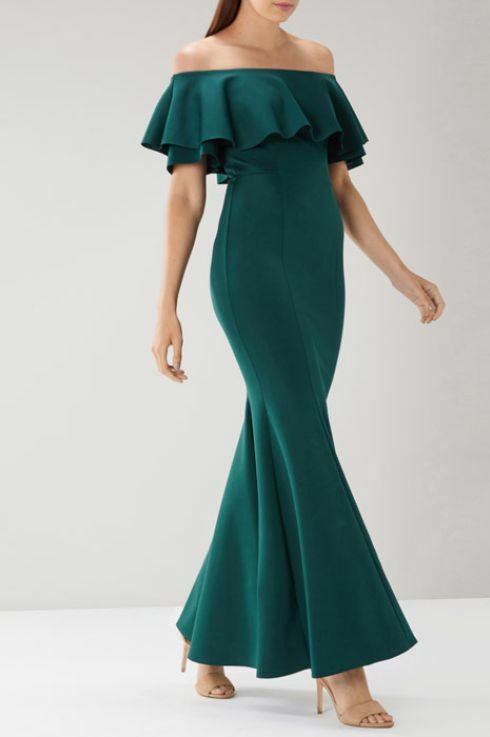 With a wispy, off the shoulder neckline that flatters all shapes, this Tadashi Shoji dress is perfect for a special occasion or when you want to make an impact. It needs nothing else but simple jewellery, elegant heels and the perfect occasion. 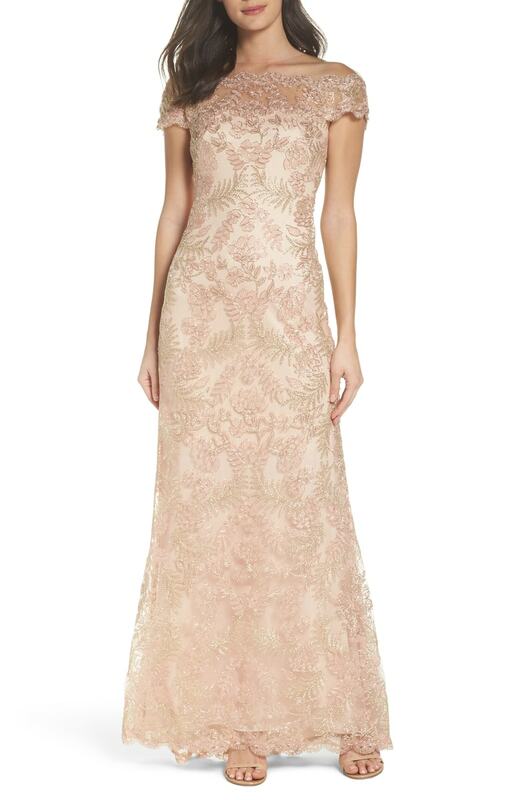 If your arms are not your favourite area, this lace number is the maxi dress for you. The three-quarter sleeves are flattering, whilst the semi-sheer material means they don’t look heavy for evening wear. 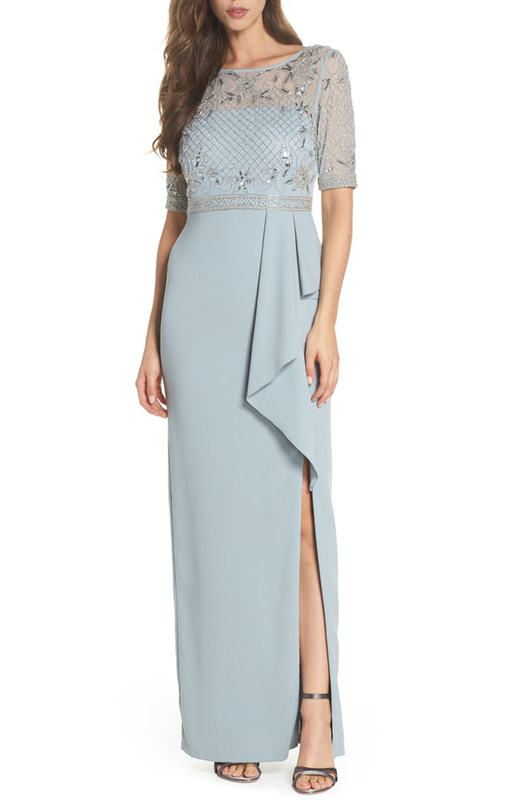 Scalloped lace alight in sequins, layers the bodice of this elegant, airy gown that gives the impression of coordinated separates with the ease of a one-piece ensemble. Now this is what we call a ‘wow’ piece. Timeless yet modern, the Chloe Bardot Maxi Dress from Coast is a sophisticated choice. Featuring a glamorous fishtail silhouette with a flattering bardot neckline for the perfect understated look. Whilst this will definitely flatter an hourglass shape, the nipped in waist would also add curves to an athletic silhouette. For a rectangle shape, the flouncy mermaid finish will give you some curves. 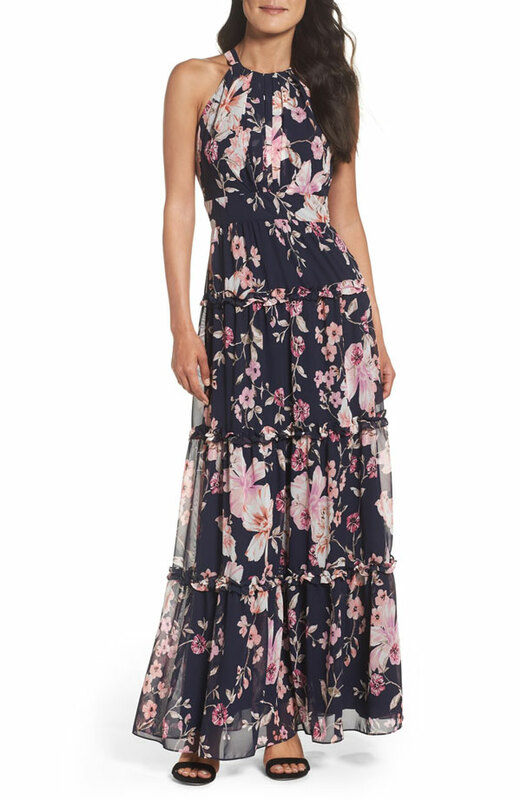 Maxi dresses don’t just have to be for night times or occasions, we say work the trend at the weekend with this floaty, floral-patterned dress from I.N.C. International Concepts’. 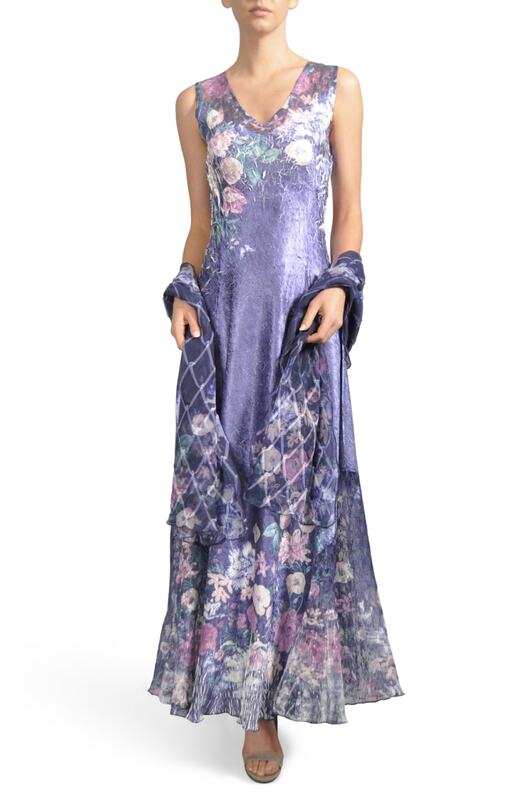 Set to stun in this gorgeous watercolor-inspired ethereal, sweeping petite maxi dress with belted waist for a flattering silhouette. 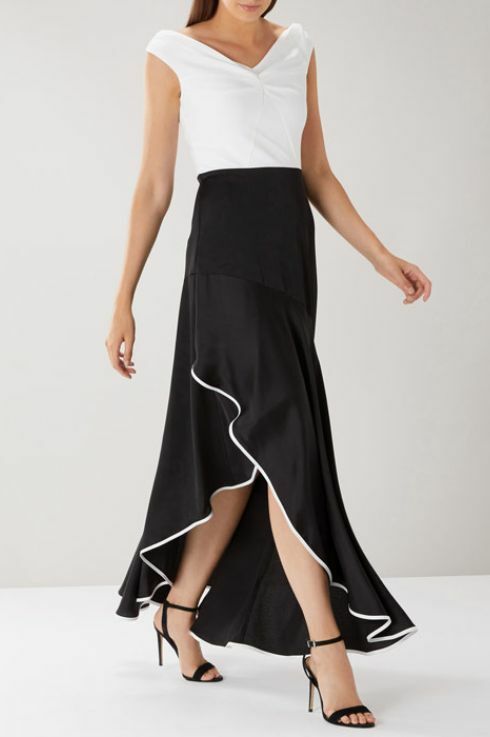 There are an abundance of gorgeous petite maxi dresses around at the moment, thanks to the number of designers showing maxi dresses on the catwalk. 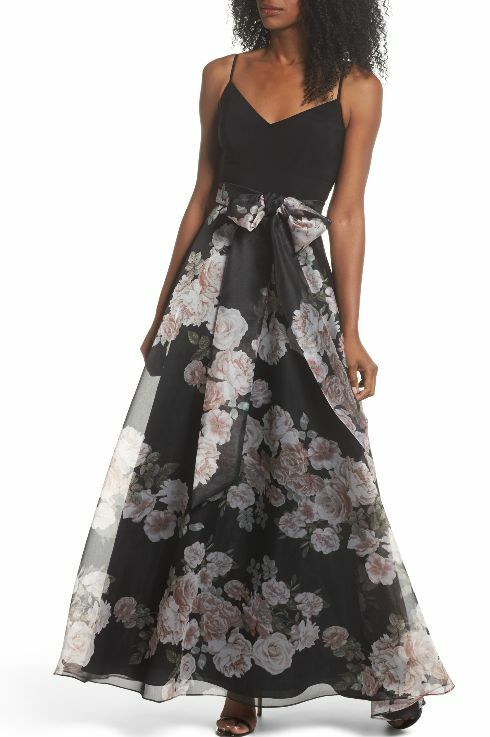 This beautiful maxi would be a perfect wedding guest or black tie outfit; this showstopping gown boasts a camisole-style bodice that offers sleek, modern contrast to the voluminous organza skirt of an updated ballgown wrapped with a waist-accenting sash. You will be seeing petite dresses galore in this season’s must have velvet texture. The slimming 40s style of the navy maxi is cut perfectly to suit an apple, hourglass or pear shape. This is a real investment piece that won’t date, you’ll be wearing this dress for seasons to come. We cited this stunning deep blue hue as one of our top trending colours. From the catwalk to our favourite petite celebrities, this colour isn’t going anywhere soon. Pair with peep toe heels for a polished evening look, knowing this maxi dresses’ clever cut is ensuring you look your best. This patterned jersey maxi from Boden is a chic take on the casual dress. Embrace your inner romantic with this ankle-length dress. 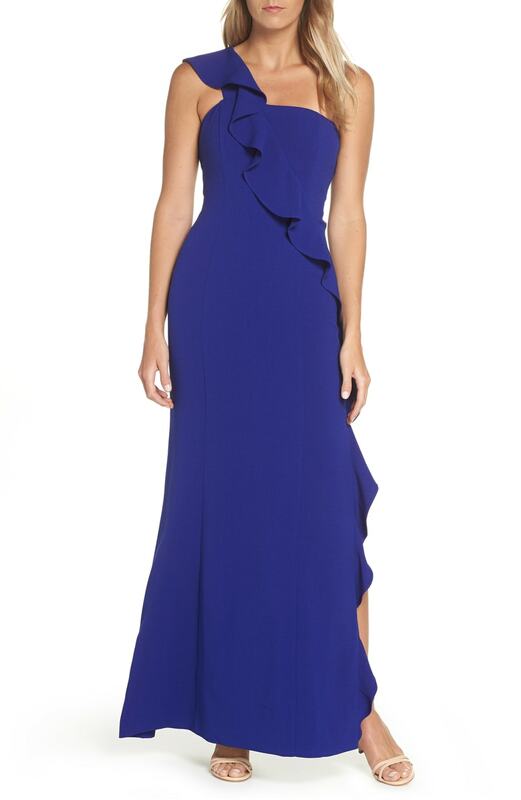 The deep V-neck and gathered waist create a classic shape, while pleats front and back make a voluminous skirt. Experience the soft, drapey fabric for yourself and we guarantee it’ll be love at first wear. 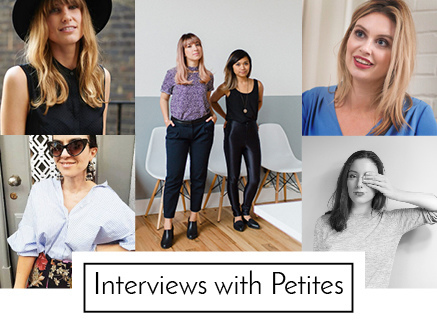 This style is a winner for curvy and pear shaped petites. 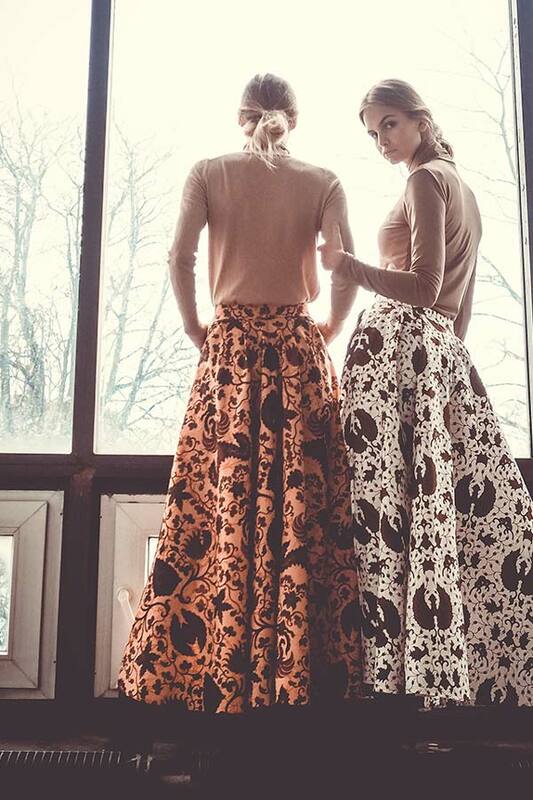 Looking for a skirt that makes a statement? You’ve found it. The bold print gives this flared, A-line skirt an attention-grabbing finish and the longer length will work whatever the occasion. Dress yourself up or down in maxi skirts designed to impress. This skirt can take you through every season – from summer days with sandals and tank top, to ankle boots and layering in the colder months.